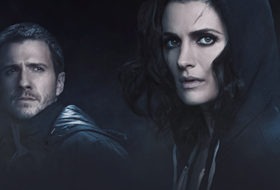 Stana made her film debut in the independently shot film Shut Eye in 2003, before landing guest appearances in 2004 on shows such as Alias, The Handler, Dragnet, The Shield and JAG. In 2005 she shot another indie film titled Pit Fighter, along with a guest appearance on TV’s The Closer and a two-episode arc on ER. In 2006, Stana enjoyed repeat performances as Collette Stenger in 24‘s season 5, and the following year made two appearances on Heroes as Hana Gitleman, a character introduced in the series’ graphic novel spin-offs. Other TV appearances include Brothers & Sisters, CSI: Miami, and The Unit. She was top-billed in the 2008 violent independent thriller Stiletto. Also in the same year she filmed Canadian miniseries Would Be Kings, and co-starred in the third installment of TNT’s The Librarian trilogy, The Librarian: Curse of the Judas Chalice. Other feature credits include The Double, Quantum of Solace, Feast of Love, and The Spirit. 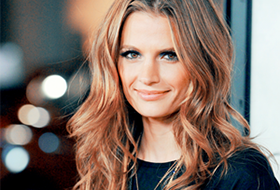 In May 2008, Stana received word she booked the character of Kate Beckett on Castle, alongside Nathan Fillion. The show premiered in March 2009. In 2010, she filmed For Lovers Only with the Polish brothers. The film was shot in Paris and in the spirit of French New Wave. She served as a jury member at the 2011 Zlín Film Festival, where For Lovers Only made its world premiere. In conjunction with the 2011 San Diego Comic-Con, there was an official announcement that she would become the voice for Talia al Ghul in Batman: Arkham City. In 2013, Stana landed a role in the feature film CBGB, which offered an inside look at New York City’s famed punk rock nightclub of the same name. She played Genya Ravan, a music producer and former lead singer of the 1960’s rock band Goldie & the Gingerbreads. In the same year, Stana co-starred in the film Big Sur, about writer Jack Kerouac’s life after he wrote On the Road. In the film, she portrays real-life legend Lenore Kandel — a San Francisco poet who played a pivotal role in the cultural revolution of the late 1960s. She also lent her voice to Superman: Unbound, as Lois Lane. Stana spent the summer of 2014 filming The Tourist, an indie film co-starring Brett Dalton and directed by Evan Oppenheimer. Filmed in Italy, the project takes a look at the inner workings of a brutal Renaissance Florentine sport called Calcio Storico. The film has yet to be released. Most recently, Stana just completed work on The Rendezvous, a loose adaptation of Sarah Isaias’ book A New Song. The story follows an unlikely pair who find themselves swept up in a deadly race to find a sacred Dead Sea Scroll hidden in the ancient city of Petra. The film co-stars Raza Jaffrey and is directed by Amin Matalqa. After wrapping on The Rendezvous, Stana immediately dove into “Sister Cities,” a film based on the internationally acclaimed play by Colette Freedman. Stana began filming the eighth and current season of Castle in July 2015, and was announced as a producer for the show as well.